Arwen was glad to be home. It was good to see her father and brothers again after so long. She had almost forgotten how beautiful Imladris was at this time of year when the daffodils carpeted the woodland with their fair golden trumpets heralding the arrival of spring. This evening she had chosen to walk in the shade of the birches. As the sun began to sink beneath the western horizon her thoughts turned to her mother far beyond the sea. She missed her greatly and there were times she wished that she had chosen to accompany her. Her grandmother had told her that she had foreseen that Arwen’s destiny lay in Middle-earth, but she had no idea what that destiny might be. Would she ever find the love her parents had known and bear children? 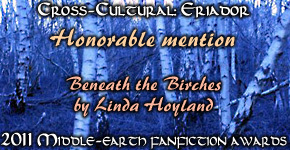 She knew all the male Elves at both Imladris and Lothlórien and not one had stirred her heart. Or would she spend the endless measure of her days as her father's hostess, the esteemed Lady of Rivendell, but in truth, little more than an ornament? Arwen felt there must be surely more to life than presiding over feasts and listening to minstrels praising her beauty. Suddenly she heard singing, the strong virile tones of a young man. He sang of the glorious deeds of her ancestors, Lúthien and Beren. 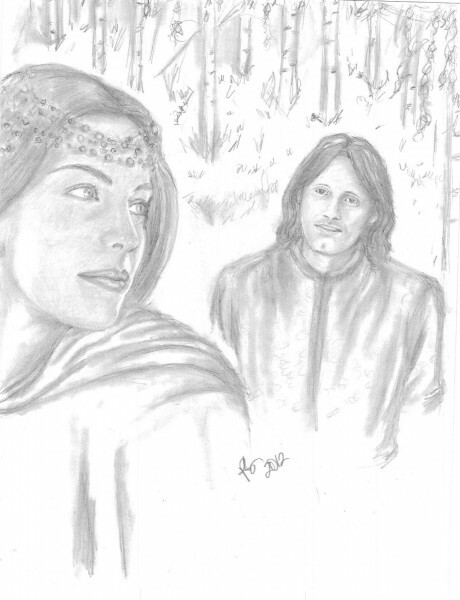 Arwen had often pondered Lúthien’s fate. What must it be like to love someone so much that even forsaking the life of the Eldar was not too great a price to pay? Many a mortal man had fallen in love with her, or so they claimed, swearing their hearts were forever in her keeping. They were all likeable young men and she pitied them, but the idea of sharing Lúthien’s fate for them was absurd! Luckily, they swiftly forgot her and married amongst their own kind. The wind whipped her hair as she turned to look at the approaching young man who called out, “Tinúviel. Tinúviel!” as if he mistook her for her famous foremother. He was little more than a boy, albeit a comely one, tall and graceful in his bearing with windswept dark hair and expressive grey eyes, which were filled with all too familiar adoration when he looked at her, no doubt already imagining them both smitten by star crossed love! He bent and plucked a handful of daffodils, offering them to her in a gesture of chivalry. He spoke, asking her name and introducing himself as “Aragorn son of Arathorn”. She replied gravely, intending to gently but firmly steer his thoughts away from her. And yet something seemed different about this young man. She was oddly moved by him, sensing here was more than just a passionate heart, but also a noble one. She found herself telling the boy that maybe her fate would not be unlike Lúthien’s when he told her that he for a moment had believed his song had caused Lúthien to appear before his eyes. Whatever had possessed her to think such a thing, never mind say it? What was wrong with her? She was not Lúthien, but Arwen Undómiel, who intended to choose the life of the Eldar and one day rejoin her mother in Valinor. Yet something had changed. Arwen would not easily forget Aragorn son of Arathorn.